You want to cut your chickens feed bill producing high quality compost, raising at the same time happy healthy chickens in your permaculture center? Simple, raise them on manure, they love earthworms! 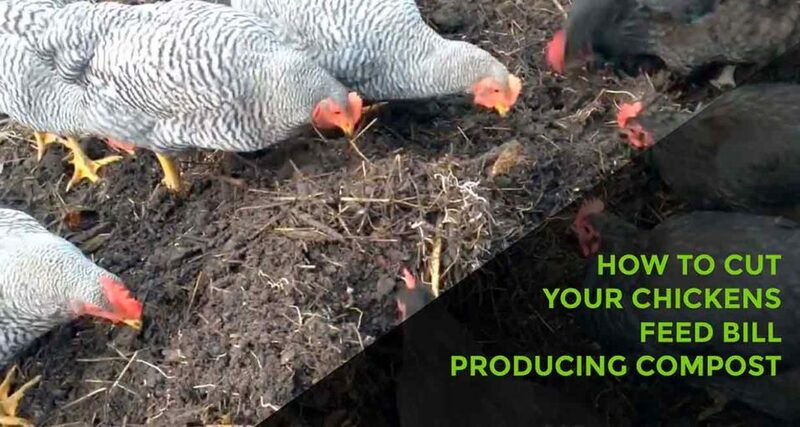 When you will incorporate chickens into your composting system, you will be very pleased not just with the daily egg production but you will discover the usefulness of them as our compost helpers. This is a way to minimize effort in your permaculture garden. Composting with Chickens: which are the benefits? Composting is a process that works to speed up the natural decay of organic material by providing the ideal conditions for detritus-eating organisms to thrive. The end-product of this concentrated decomposition process is nutrient-rich soil that can help your entire permaculture system. The key to effective composting is to create an ideal environment for the microorganisms to thrive warm temperatures, nutrients, moisture and plenty of oxygen. When chickens have access to manure, they eat the bad bugs, parasites, and larvae out of the manure. This stops the bad bugs from reproducing and possibly making your animals or pasture sick. Properly managed manure with chickens will help cut your chickens’ feed bill! Bugs, parasites, and larvae are all a good source of food. The protein and minerals in them are great for their health and help produce strong eggshells. Chickens also find and eat any undigested food. Grains and any other foods other animals didn’t fully digest—the chickens will gladly eat them. This is free chicken food! You save tons of money on chicken feed. The quality of your egg production increases, and the health of your chickens is exceptional. Benefits for the composting process! They also love working on the compost, and it keeps them busy during the day. In the winter, the pile provides added heat to their area. The compost decomposes more quickly because the continued efforts of the chickens facilitate the composting process. They scratch and tear and work at the pile all day long. While doing so, they also add their own droppings to the pile, which is an additional bonus. Getting Started Composting with Chickens! 1. Create a composting area in your chicken coop where you can easily dump your organic material. 2. Add organic material to the compost and don’t worry about mixing the pile — your chickens will tear into this naturally and do the work for you. After you obtain your base organic materials, heap it into a pile and work on adding your kitchen scraps. As you add material to the pile, the chickens quite instinctively will head for the pile and began working it. 4. Cleaning the chicken coop: When cleaning your chicken coop, you can now just dump the droppings into the compost pile and the chickens will mix all that organic material right into the pile. At Edible Acres, chickens generates about 4 wheelbarrow loads of compost a week during the summer. Chickens give them 12-16 eggs a day and they cost them about a penny per bird per day. Their main expense is buying in millet and sunflower seeds. The other whole grains they barter for, and they collect compost scraps from local organic sources, as well as hay and wood chips to make the basic bulk mix. Be sure to share this post to inspire your friends and family to cut your chickens feed bill producing high quality compost!